Born in North Karnataka in 1967, Venerable Bhikkhu Ananda took ordination as a Buddhist monk under the Most Venerable Acharya Buddharakkhita, one of the foremost Buddhist scholars in the world and founder of the Maha Bodhi Society, Bangalore, in 1986. Even during childhood he showed in interest in philosophical thinking and meditation. Ven. Bhikkhu Ananda is the General Secretary of Maha Bodhi Society, Bangalore and its branches. In 1987 he became secretary of Maha Bodhi Society and under the compassionate guidance of Ven. Acharya Buddharakkhita became involved in its many programs, both spiritual and social. He is one of the main teachers at the Mahabodhi Monastic Institute, the largest Theravada monastic school in India. He conducts Sutta, Pali and Abhidhamma classes, gives discourses and leads meditation retreats in India and abroad. Since 1998 Ven. 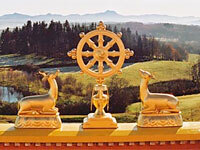 Bhikkhu Ananda has been traveling yearly to Europe bringing the precious teaching of the Buddha. Hundreds of people have been reached through meditation retreats and talks, including at universities and schools. High interest in these programs has enabled him to establish Mahabodhi groups and associations in Germany, Switzerland, France, Belgium, Holland, Spain and Austria. For decades Ven. Bhikkhu Ananda has been deeply involved in Maha Bodhi Society’s important social services through educational programs, meditation guidance and medical services, developing hospitals and clinics. With the kind help of generous donors at home and abroad, Maha Bodhi Society has been directly involved in establishing schools and hostels in Bangalore, Mysore and Diyun providing quality education for underprivileged children. Additionally, there are elder homes in Tawang and Tripura for disabled and frail seniors with no family support. Sponsorships are sought to assist the needy in these projects. Six hospitals and clinics have been built over the years treating patients without regard for their ability to pay. These have addressed serious issues like burn cases and providing artificial limbs. 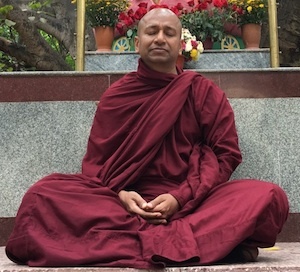 Currently he is involved in developing projects including The Bhavagan Buddha University of Pali and Theravada Buddhism, the Mahabodhi Karuna Medical Center (rehab hospital nearly unique in India) and leading regular meditation retreats at the Mahabodhi Center. For more information on Ven. Bhikkhu Ananda’s work and activities and those of Maha Bodhi Society, Bangalore please visit www.mahabodhi.info. Please contact the listed organizer if you have interest in a program, discourse or mediation talk by this compassionate, experienced and enlightening Buddhist monk at an event in your area. A list of topics for talks is available (see above) to choose one of highest interest to your organization. Please note that this page will be updated with more complete details, topics of talks, locations etc. as they are finalized. May 23 (Tuesday) : Everett Community College, World Religion class taught by Dr.
June 22 (Thursday) : Manhattan, Sixth Street Community Center, 638 E Sixth Street, New York, NY 10009. Meditation class and dhamma talk. 7pm-8:30pm (open to public)Overcoming Anxiety: Anxiety is an extremely common experience, particularly in this time in history; and if we do not learn how to conquer it, we can easily be overwhelmed. So if we wish to live a more peaceful life, it is wise to learn how to cope with anxiety. The Buddha’s teachings offer many practical techniques for confronting anxiety, overcoming it, and stopping it completely.Bhante Ananda will speak about the nature of anxiety and explain how we can recognize it, face it, and remove it – not just for temporary relief, but for lasting peace and serenity. Additionally, Lecture on Meditation Techniques will be given by Bhante Ananda.